The problem was asking us to find AD and CD, AD being the distance between the airplane and the base of the control tower, and CD being the height of the control tower of the airport. We are given the angles of depression. First, let's find AD. That is easy. In the right triangle ABD, we know one of the legs (AB) and the angle A (33°). So, we can use COSINE. Then, we go on to find CD. For that, we need to calculate the two lengths BD and BC and subtract those. For both BD and BC we can use the TANGENT function, but from two different triangles. from which BD = 8.5 km (tan 33°) = 5.519964542 km. Subtracting the two, we get BD - BC = 0.612 km or 612 meters. I've written a comprehensive review of Hands-On Equations, a program that lets students solve linear equations using a balance scale - making it like a "play." I was impressed with this program - it teaches them equations that even include negative unknowns and negative numbers and require the usage of the distributive property. I just learned that About.com readers have voted for their best homeschool math resources, five finalists were chosen, and Math Mammoth is one of the finalists or nominees for the Readers' Choice Award! 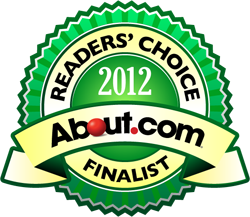 The final voting has started (among the finalists) and continues through March 21, 2012. By the way, the five finalists are Math Mammoth, Math-U-See, Life of Fred Mathematics, Singapore Math, and Teaching Textbooks. From February 19 till midnight February 22, get 23% off of all Math Mammoth downloads & CDs at Kagi store. P.S. Homeschool Buyers Co-op will soon run a group buy for Math Mammoth (in March). From a horizontal distance of 8.5km a pilot observes that the angle of depression of the top and base of a central tower are 30 degrees and 33 degrees respectively. b. the height of the central tower. Actually, a good part of this problem is to draw the correct diagram. Once you have the image right, then the math should be fairly obvious. The solution is posted here. Math Teachers at Play #47 blog carnival is now online at Math Hombre... Go visit it! One of my favorites was the entry about proportions/playing with Barbies and another this fraction catch game. In general, I really, really like the Common Core Standards for math. There is some emphasis and explicit mentions of mental math skills, there is emphasis on conceptual understanding -- even a mention of the "bar models" (though they were called line diagrams) -- yet fluency of math facts and of the four operations are included as well. So I'm not really complaining here! But I've found a few little things there, pet peeves of mine, if you allow, that I don't quite follow, so I thought of posting such here and seeing if any of you have some ideas for me. Here's one for 5th grade. I got an email from Lulu... With this coupon, you can buy (some? or all?) Math Mammoth titles as printed books at Lulu for 30% off. This great offer ends on 19 February 2012 at 11:59 PM. I'm sorry I can't tell from their email if this applies to all the books at Lulu, or only some. You have to try it. They sent it to me as applying to the 1-B worktext or "any other title". This is a solution to the triangle problem I posted here. The picture is below; we are to find the area of the triangle. Since AC is tangent to the circle at D and AB is tangent to the circle at E, then the distances AD and AE are equal. That is, AE must be 2. I can't remember nor find a name for this theorem. It has to do with two tangents from the same point (and it is easy to prove using congruent triangles), saying that those distances are congruent. Similarly, CD and CF are congruent -- both are 3. And also by the same reasoning, BE = BF (because BA and BC are tangets to the circle). I will call BE and BF as x, it's easier to manipulate in an equation. Now, we can solve x fairly easily by applying the Pythagorean theorem to the right triangle ABC. x = − 6 or x = 1. Obviously we choose x = 1. Homeschool.com recently compiled a list of Top 100 educational websites used by homeschoolers. I got notified because my site got on the list! But, looking the list over, I found some that I didn't know about that I will definitely be using with my kids. In fact, I already started with one, that is, English Grammar 101. It has FREE interactive grammar lessons, just exactly what my kiddos needed. Another one from the list we'll be using is Geography4kids.com and its "sister" websites about chemistry, physics, biology, and so on. Actually, now it is World Education Games, incorporating World Math Day. World Education Games has actually THREE different events: World Spelling Day (6 March), World Math Day (7 March), and World Science Day (8 March). It is free to register and fun. For the World Math Day, you get the opportunity to compete in real time with millions of students from around the world in 60 second math challenges. I don't know how the spelling and science works. Registration is free and has opened Feb 1, 2012. You can practice fore free at the site after registering. The figure shows a right triangle ABC. 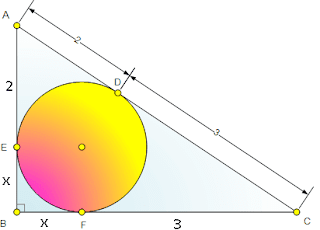 The inscribed circle and the hypotenuse are tangent at D. If AD = 2, and CD = 3, find the area of triangle ABC. The solution is now posted here!